Air Velocity Monitor the efficiency of your heating and air conditioning system or the force of the wind in your outdoor location. Conductivity Conductivity is an important parameter indicating the quality of water and other liquids. Flow Meters Monitor or control the flow rate of your fluid for better control and feedback. Data Loggers Battery operated data loggers allow you to monitor a wide range of environmental conditions - temperature, humidity, pressure, pH, etc. Compact size allows these instruments to fit almost anywhere. Intrinsically safe models available. Dissolved Oxygen Oxygen levels for important for biocompatibility. Portable devices can be used to monitor lakes and streams. Pressure Test problem areas or verify sensor operation with our portable manometers. Digital display provides immediate feedback of sensor measurement. Select from several models with differing pressure ranges. Refractometers Refractive Index is a simple way to monitor fluid concentrations for many different materials including sugar, water, protein, glycol, battery acid and many more. We have two different refractometer products that will provide cost-effective solutions to your test and measurement requirements. Relative Humidity Environmental measurements are easy with these low cost instruments. Select from models with varying accuracy and display sizes. The low cost transmitter is ideal for long term monitoring requirements. Wide range of small fluid transfer pumps to meet your application requirements. Most pumps are designed for liquids, but check out the vacuum pressure pumps for your air transfer applications. Select from our range of tubing and fittings to tie the whole system together. 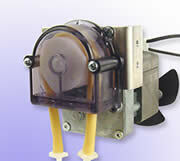 Peristaltic Pumps Limit exposure of your fluid to only the tubing. These self-priming pumps adapt easily to many intermittent or specialty pump applications. Change the tubing to renew the pumps and/or change compatibility. Reversible, self-priming, handles particulates and viscous fluids easily. Tubing & Fittings Connecting sensors, pumps, valves and instrumentation together for smooth fluid transfer is an important part of all systems. Fitting and tubing options found here are a few of those that we have available. It is important to consider size, compatibility, durability and cost when installing these components. The tubing and fittings listed here are ideal for extension tubing for the pumps listed on this web-site. Check the specific pump page for replacement pump tubing. RF Transmitters RF transmitters provide a wireless transfer of monitoring and control signals between sensors, monitors, controllers and data collection devices. Wireless systems simplify installations for hard to reach locations and eliminate ground loop problems. These instruments have already been pre-approved for use and are ready for immediate installation. Data Loggers These special versions of our DL100 data loggers provide wireless datalogging up to 0.5mi.